1.- Towards the middle of the 13th century, the first forms of cultivated Spanish poetry written in the Romance language were documented. 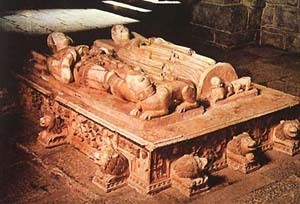 It was written by clergymen and follows medieval Latin models, with probable French influence. It was to survive throughout the following century. Its most characteristic verse is the "cuaderna vía", in alexandrine verses of 14 (seven plus seven) syllables. It is known as "mester de clerecía" (mester signifies ‘profession’ and comes from ministerium) and its themes are very varied. 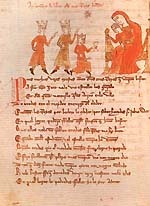 The 13th century works include: a) historical, such as the Book of Alexander, about the life of Alexander the Great; b) religious, such as The Miracles of the Virgin Mary by Gonzalo de Berceo, first renowned Spanish poet and author of hagiographic works (lives of saints); c) epics, such as Poem of Fernán González; d) adventures, such as the Book of Apolonio; e) advice or knowledge, like Cato´s Examples, etc. 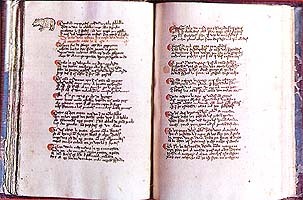 2.- There are poems from the 13th and early 14th centuries, written in verses different from the "cuaderna vía" which, although not considered "mester de clerecía", reflect their mentality to a certain extent. These are the poems of discussion, of which Reason to Love is highlighted, with its argument between wine and water, or Elena y María, in which two women defend their respective lovers: the priest and the knight. Hagiographic poems, on which minstrels had influence to a greater or lesser degree, can be incorporated in another section, like Life of St. María Egipciaca or the Book of the Three Wise Men. Already in the 14th century, the Jew Sem Tob de Carrión drew up his Moral Proverbs. Manuscript S of the Book of Good Love 3.- In the 14th century, the "mester de clerecía" offered late although more mature examples of this genre. The masterpiece Book of Good Love, by Juan Ruiz, Arcipreste de Hita, stands out. This was edited in two different versions between 1330 and 1344. It is thought of as a collection of entertaining and fundamentally love poems, derived from the Latin poet Ovidio, short stories -"exempla"-, which have come from Ysopetes and a collection of medieval fables. The second masterpiece of this time is the Rhyming Book of the Palace, by chancellor Pedro López de Ayala. The book deals with religious and ethic causes, mixed with courtesan satire. He ends on a biblical note, in his exposure of Pope San Gregorio in his Book of Job. Other "mester de clerecía" works are the Book of the Misery of Omne, Poem of Yuçuf, written in "aljamiado" (Spanish written in Arabic characters), the Proverbs of King Solomon or the Life of St. Ildefonso. 4.- The priests colaborated in the main to these poems. Perhaps their acitivity was able to extend into the apparenly epic works, such as the Poem of Alfonso XI.